Ignatius Njobvu, arguably Botswana's best ever chess player, has added the 2005 Palapye Open Championship to his many titles. He beat a massive field of 180 players from all over the country at the weekend tournament at Lotsane Senior Secondary School. 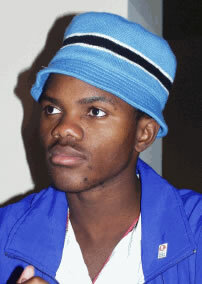 Going by the countless titles he has won, Njobvu is the most successful chess player ever in Botswana. In the two-day tournament in Palapye, he topped the field with eight points from nine games. He was the only player to finish the tournament undefeated. He drew only two games to finish half a point ahead of Barileng Gaealafshwe. Njobvu got P500 while Gaealafshwe settled for P250. Six players shared positions three to eight with seven points. The computer could not separate two of the tied players, resulting in a playoff for third place between Baone Kealeboga and Providence Oatlhotse. Kealeboga won the duel. Each one of the six players tied in third place received P60. Njobvu's victory was based on solid play and going for the simple rather than the complicated positions loved by his opponents. The tendency to avoid risk often put him in difficulties and in some games, he was lucky to emerge unscathed. Against Cinky Boikanyo in the first round, the champion only won because of a terrible blunder by his opponent in a winning position. The same can be said of his game against Gaealafswe in the penultimate round where he was outplayed in the opening. However, Njobvu has a rate mix of resilience and fighting spirit. This allows him to win even in the most demanding situations. His victory against Oatlhotse in the fifth round was achieved when he was under extreme pressure for time. Many thought his time would run out but he bared his claws and checkmated Oatlhotse with only 14 seconds left on his clock. The spectators had no alternative but to erupt into a thunderous applause. Njobvu, who together with Tuduetso Sabure and Moakofi will represent Botswana at the Africa Championships in Zambia said the tournament served as a good guide of the state of his preparation. "I have been preparing hard for the Zambia tourney and it's a huge psychological boost to have won. My confidence has gone up as a result," he said after the victory. Sabure continued her dominance by winning the women's prize with six points from nine games. She finished 20th in the whole tournament, leading some to question, informally, why women players get prizes when, for example, position ten in the tournament got none. Mosenya Ndawana, a former member of the local chess body and one of the senior players, shed some light by highlighting that women prizes are meant to encourage them to play the game. Otherwise Sabure would stay home knowing that she stands little chance of getting a prize due to the stiff competition for top places. This weekend Botswana Chess Federation (BCF) will hold the last training camp for players short-listed for the Africa Junior Championships. The final squad will be named after the training camp. Five boys and three girls are expected to represent hosts Botswana in the continental showpiece to be held at the President Hotel from December 9-22. The final team is expected to go into intensive camp training every weekend until the event.